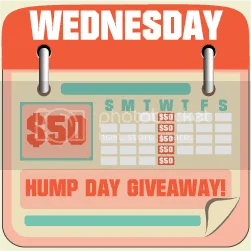 Thanks to the 30 wonderful bloggers listed below, it’s time for Hump Day $50 Giveaway once again. This week’s task is for Facebook Page likes which is super easy to do. Feel free to visit all the wonderful blogs below once you’re done entering the giveaway. You can log on to Rafflecopter via your Facebook account, or your name and email (just make sure you’re Facebook is opened so you can easily like the pages). My Tots Exactly | Frugal Experiments | Life’s Cheap Thrills | Building Carpenters | Samu’t Sari | Money Saving Mindy | Happy Home and Family | WAHMaholic | WAHMaholic Blog Designs | Beauty Queen Gene | Pinay Mama | Wrap it with Kelli | http://www.caraeclesiblings.info/ | http://www.fadandglamor.com/ | http://theoblepiasfamilyblog.info/ | http://advocatingbreastfeeding.com/ | http://mommyko.com/ | http://www.esupermommy.com/ | http://www.thecouponbuster.com/ | http://www.the24hourmommy.com/ | http://www.moviedramaaddict.com/ | Games Gadgets Galore | Shop.Crazy.Me | Mirage | Exotic Philippines | Blogger’s Tech | Living Life to the Fullest | Mommy Coupon Swappers | Delight My Appetite | Empleyado | Life’s Cheap Thrills | Cognitif, Inc. | Fabulicious DivaA note: Please join only on one blog/page PER GROUP. A maximum of 37 entries will be considered. If you have more than 37 entries, the host reserves the right to delete duplicate or fraudulent entries. Also, please use only one name and email address, or Facebook account for quicker validation of entries. On the first mandatory entry, please write Pinay Mama referred you. You must complete the first 2 tasks before the others are enabled.